I meant to post this at the beginning of Small Business Week (June 16-22), but I was too busy being a small business. I suspect most of the nation’s 28 million small businesses probably weren’t celebrating much this week either. Someone has to answer the phones, sell the product, run the reports or fill in for the person who called in sick. That’s the real-life story of mom-and-pop establishments rather than the “engines of capitalism, backbone of America” hyperbole we often hear out of Washington. On Monday, the kickoff day of Small Business Week, I was driving to the post office to make sure my second-quarter, estimated income taxes were postmarked on time. How ironic, I thought, that the Small Business Administration would pick a tax day for self-employed people to begin its celebration. Uncle Sam is a funny guy. Small Business Week is the kind of thing that Chambers of Commerce and business associations love. When I worked at the National Restaurant Association, we were plugged into all kinds of activities with the SBA. If you’re a PR guy, this is pure gold for proclamations, speeches and events. Back when I was writing press releases about how restaurateurs embody the true spirit of entrepreneurism, I had no idea what it takes to run a Main Street business. I have a hunch that is the case with most speechwriters who write Small Business Week remarks for their bosses. Some days it does feel like I’m a rolling stone. I would say that there is a definite gap between the rhetoric of free enterprise and its practice. Jay Morris Communications LLC is alive and kicking, but to say that I am an independent business person may be a stretch. I am independent in that I have my own firm and rely on it for my income. But that income is not enough (yet) to fully sustain my lifestyle (i.e., pay all my bills). I’ve had to dip into my savings to cover my expenses. The question I’ve been grappling with lately is how long do I pursue this adventure? At what point do I say, “That’s it, I’m pulling the plug”? My accountant, who has other small business clients, tells me it may take three to five years before I make a decent income. That’s a long time to be eating beans and hotdogs. For now, I keep at it, convinced that with a few more projects, a big client or two, this thing could work! That’s the dream—that we all can succeed if we just put our minds to it and work hard enough. That’s what keeps me fired up, still. So kudos to small businesses. Kudos to us because, as President Obama said this week, over half of all Americans work for a small business. 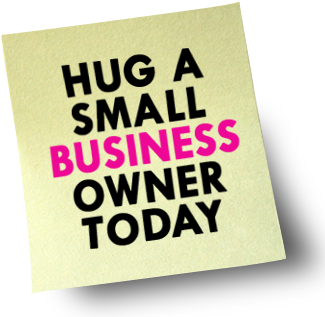 Hug a small business owner today, and put those hotdogs on the grill! This entry was posted in Entrepreneurship, Staying motivated and tagged Bob Dylan, SBA, small business owner, Small Business Week. Bookmark the permalink. I was a finalist for a fellowship last year with a proposal focused on independents like yourself, and me. Policymakers have little idea what we want and need and we don’t seem to have much of a collective political voice (aka lobbyists.) We contribute a tremendous amount to the American economy but receive little media attention. You make a good point about being underrepresented in Washington. Traditional small business groups like NFIB probably are not quite what we need. A good topic for a future blog post!